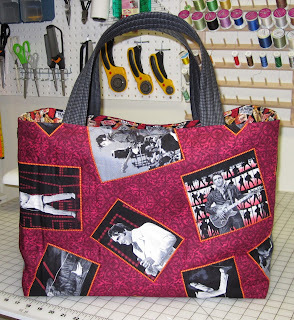 I finished another commissioned bag. This one was requested in Elvis fabric and I was lucky enough to find some. Both of the outside panels look the same except the other side is turned over so the pictures that are upside down on this side are right-side up on the other...confusing I know, Just trust me it looks good!! 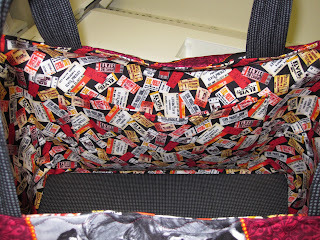 I love the inside fabric with all the ticket stubs from Elvis concerts over the years of his career. I have four of my six batches of Christmas cookies done...Going to have my nephew, Austin, help decorate our little tree today...then I've got to get started on making our Christmas cards...Already got our first one in the mail today!! Okay, Martha...you're killing me! I've got my candles in the windows and three presents wrapped. That's it...I won't even THINK about Xmas backing until the end of next week! Oh Edna, I'm glad you like the bag. Sorry but I dont have any more of the fabric.